If you’re the parent of a girl, you probably tell her she can be anything when she grows up—even President of the United States. Somehow, though, a lot of girls don’t hear or believe this message. Women are underrepresented in all of the STEM (science, technology, engineering, math) fields, and many girls believe they are not as smart as boys in these areas. 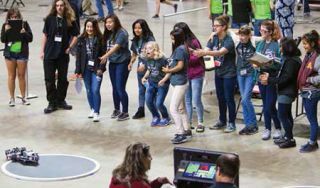 That’s why it’s more important than ever to encourage girls and young women to pursue STEM opportunities, just like these schools and districts are doing. The Hoover STEM Girls Robotics Team prepares for competition. Five years ago, the governor of Iowa established a $400,000 line-item budget for STEM and established the Iowa Governor’s STEM Council. Hoover High School in Des Moines received a redesign grant and updated two rooms with Epson BrightLink interactive projectors. The redesign helped to change the way teachers design learning. “Now our students collaborate, do authentic research, and so on,” says Maureen Griffin, school improvement leader and STEM administrator. Additional grants helped the school launch HyperStream, a STEM program that exposes students in grades 5-12 to technology through hands-on projects, competitions, and the chance to work with mentors. Hoover High partnered with the Girl Scouts and Drake University to offer robotics opportunities for girls. Middle school girls build and test turbines. Using STEM machinery is status quo at Anderson High School. Eleven years ago, when he was teaching chemistry and physics at Austin (TX) ISD’s Anderson High School, John Sperry started a competitive robotics team. Today, he runs the 350-student robotics and engineering program, which offers 23 different technology courses in five pathways: mechanical engineering, robotics, manufacturing, software engineering, and electrical engineering. “Part of our challenge is to always be redefining what STEM engagement looks like,” says Sperry. One way he engages his female students is by having everyone try to solve big problems. For example, students repurposed a control system to try to create a better-functioning knee brace. The students presented their brace during National Instruments’ NIWeek in front of 5,000 engineers, and the lead student, a senior girl, went on to study mechanical engineering and now works for NI. The Programming Princesses are equally proud of their robots and tiaras. Girls learn how to measure properly for their woodworking projects. When Stephanie Miller became superintendent/principal of Congress (AZ) School District #17 in 2011, the preK-8 rural school was high-performing but she felt it needed more STEM development. She secured a three-year grant from the Science Foundation of Arizona to increase project-based learning (PBL) around STEM and develop STEM career paths. To shift the culture, the district embedded LEGO WeDo 2.0 into classroom instruction, integrated STEM learning throughout all grades, and started an after-school STEM program. “With after-school programs, you get a lot of ‘I wouldn’t be good at that,’” says Miller. “If you put programming into class instruction, you reach the children who were too shy to sign up or didn’t know they had a natural ability.” By developing their own curriculum with LEGO WeDo and incorporating a lot of engineering and programming components, students got a broader understanding of STEM fields. They used Defined STEM, an online curriculum featuring project-based lessons that develop critical thinking and problem-solving skills, to help students learn and discover STEM careers. "Defined STEM has lots of women in their videos. When students see that, it’s eye-opening,” says IT Director Suzanne Sims. Teachers focused on social and emotional learning, helping students learn how to get along with others and work with different people to find answers to problems. Teachers created STEM-based units that are taught in core subjects. Now they are starting to do passion projects in the new makerspace. Every week, a community volunteer comes to the makerspace to help with woodworking projects; there’s also a deconstruction station where children take things apart. All students, even kindergarteners, build things so that girls don’t think of construction as a male job. “Through all of this exposure, girls are becoming interested in STEM careers. They are empowered and believe in themselves,” says Miller. All students do STEM projects at Bullis Charter School. Younger students apply science and engineering practices to science activities, such as when the first graders raise tulips and explore which conditions best help the plants grow. A former student studied chemistry in college and is now designing ways to protect plants from pathogens in the field. Students explore coding through physical movement, robots, and block programming. Second graders create Scratch games to teach others about proper nutrition; eighth graders study app development and design their own educational apps. One student created an app to help students develop number sense and it’s available in the Apple Store. She went on to publish five more apps in the Apple Store, including one that helps shelter animals get adopted. Second graders use the design thinking process to engineer ways to protect leatherback sea turtles from threats. Middle schoolers participate in hackathons, working collaboratively to discover solutions to questions grounded in complex, real-world scenarios. All students use math in real-life situations, such as first graders collecting data on plants and animals in the garden or seventh graders drafting plans for furniture that they build using wood and hand tools. Three eighth-grade girls won the environment category in the 2015 Dare 2B Digital Innovation Challenge. By incorporating STEM throughout their school career, allows all students to tap into what they love to do. Middle school girls learn about STEM careers at the very popular #girlSTEM conference. In Bucks County, Pennsylvania, middle school and high school girls get to meet women in STEM at #girlSTEM, a one-day conference held each May. “It’s become wildly popular,” says Lindsey Rutherford Sides, coordinator of teaching, learning, and nonpublic programs for Bucks County Intermediate Unit #22, an intermediary between the Pennsylvania Department of Education and 13 local school districts. “Each district gets a certain number of seats, and we’ve grown from 150 attendees in 2011 to 810 attendees this year.” The event, which is at Delaware Valley University, features interactive seminars, hands-on workshops, and discussions with female engineers, doctors, scientists, and programmers. Conference attendees sign up online and choose three different sessions at which they hear about the presenter’s career path and day-to-day life. Alex Dainis, a graduate student at Stanford, runs the popular YouTube science channel, Alex Dainis (www.youtube.com/user/Lexie527). Her goal is to show everyone why STEM, particularly science, is fun and for everyone. T&L asked Dainis for more ideas on getting girls into STEM. A: As a kid, I loved languages and writing and math and science, but science was the subject that let me really ask questions and find out more about the world around me. My fifth-grade science teacher, who wore Converse high-tops, showed me that science could be cool. My AP bio teacher, who brought us on a field trip to a research lab, taught me what the day-to-day of science could be like. Q: Why do you think science/STEM is a good field for people to pursue? A: Science and STEM have so many possibilities for future careers and for learning about the world around you. As we face questions about feeding increasing populations, battling diseases, and climate change, there will be an ever-growing demand for STEM workers. However, science is also just fun! Being a scientist lets me ask questions in the lab all day and try out brand new solutions. Q: Why should more girls pursue STEM opportunities? A: I think that more kids in general, not just girls, should pursue STEM opportunities. Kids are naturally interested in asking questions about the world around them, but at some point, especially for girls, that stops being cool. If we can encourage kids that everyone should be asking these questions, and that doing so through science can be fun and fulfilling, then we could take away some of that early bias that may make girls turn away from science. Science benefits from having a diverse group of people working on problems to bring the best, most creative solutions to the table. Q: Any ideas on how teachers/schools can encourage girls to enter STEM fields? A: I think that having great female role models is one way to encourage more girls to participate in STEM. These can be female science teachers, visiting scientists, or scientists on TV or the Internet. Being able to see someone “like you” in a career makes it a lot easier to imagine yourself in the same place. Excellent outreach programs like Skype a Scientist (gomcb.rso.uconn.edu/skype-a-scientist) can bring scientists into the classroom to show everyone that scientists are real, fun, exciting people, not just boring workers in lab coats.